When you say the word ‘hiring,’ many entrepreneurs shiver with dread. It’s a complicated process, and especially in the early stages of your company, it means adding a huge wildcard to your business. But hiring doesn’t have to be so scary! From your first hire to your 100th hire and beyond, our Golden Triangle framework will get you through. If you’re interested in learning about interviewing, check out our lesson here. Particularly in the early stages of your startup, hiring is going to be incredibly important. One mistake can take your whole company off-track, so it’s essential to pay attention! It’s important to remember that A-players hire A-players, but B-players hire C-players because of their insecurities. C-players will cost you your company! Can the candidate be successful at the job? Will they love the job? Will they fit into, and reinforce, the culture? We’re going to start off simple here, with the easiest piece of our framework: Experience, Knowledge, Skills (EKS), and IQ. This is the easiest section to evaluate because you don’t have to look far: all of this information will be in the candidate’s résumé! You can, and should, also ask some important questions in your interview to help you see their EKS and IQ in action. To some, Experience, Knowledge, and Skills may all sound like the same thing, but they aren’t! Experience, Knowledge, and Skills are really the things that will set your candidate up for success, so it’s important to pay close attention. Experience: What the candidate has done in the past to prepare them for the job. For example, do they have managerial experience? Do they have experience with a startup? Knowledge: The expertise the candidate has in relation to your industry or job title. Ask them: have they worked in the industry before? Do they have a related degree? Skills: The training the candidate has in relation to the job requirements. Think here about the skills needed to succeed in the position. If it’s a software development position, do they code in the necessary languages? If it’s a secretarial position, are they capable of organizing other people? IQ, or intellectual quotient, is typically a score that’s derived from standardized tests that are used to measure intelligence. We don’t mean that they have to take an IQ test in the middle of their interview! We also don’t mean that it’s necessary to have textbooks memorized. What you should really look for here is problem-solving capability. This is often easy to test: ask candidates about a problem they’ve solved in the past, or give them a small task that requires them to solve a problem. Note that IQ shouldn’t be the most important thing on your list. This is a mistake many entrepreneurs make, and they end up regretting it! If you only hire people with a high IQ, you often fail in building a team. The smartest people often know they’re the smartest people, and they tend not to have any interest in working with other people or admitting their faults. This tends to make those people difficult to work with! Round out the ‘smarts’ of a person with their experience, knowledge, and skills, but be sure to include the other categories in the Golden Triangle. You might be thinking, well, I’ve heard of IQ, but what are EQ and CQ?! At Startup Secrets, we love our acronyms, so here are two more: emotional quotient (EQ), and cultural quotient (CQ). These two quotients are not measures of smarts like IQ and EKS, but rather measures of the candidate’s ability to work with other people. The idea of Emotional Quotient can be summed up in one short statement: How well someone interacts with other people. This is going to be relevant for your candidate in terms of being able to interact with customers, colleagues, and outside partners. Emotional Quotient is hugely tied to your culture, but is essential for building relationships. If you have a culture that devalues EQ, and instead focuses on ruthless, results-driven professional spaces, you may have to worry less about EQ in your hires. But if you have more of a positive, customer-oriented culture, EQ will be very important. The ability for a candidate to positively interact with others will allow for them to build strong relationships within and outside of your company. Lots of startups also find the need to “speed-team,” or constantly form and reform teams around specific issues, as most startups have a revolving door of problems to solve. Your team will need to move quickly and work with other people in multidisciplinary, cross-functional ways. High EQ is one of the personality traits that will allow your team members to move through smaller team settings in a flexible and easy manner. To assess EQ, you’ll have to have a conversation with your candidate. It’s not something that can easily be seen in a résumé or cover letter. The base check for EQ should be how well they interact with you, the interviewer. If they automatically have poor relational skills, they may have low EQ. You can also ask one of our favorite questions for measuring EQ: what are you most proud of in your work interactions? Try to pull the candidate out of their shell and see how well they work with other people. Your Cultural Quotient is similar to your Emotional Quotient; instead of how well they deal with other people, CQ measures how well they fit into your culture. Every new hire, especially in the early stages of your company, needs to fit into and reinforce the cultural values that you’ve set. As we said in the lesson on defining culture, this means that some potential hires should look at your cultural values and say, No, not for me! But it should also draw in a lot of attractive candidates that are interested in how you do business. CQ is so important because if you hire someone who doesn’t belong in your cultural space, you’re detracting from the success of your startup. That hire won’t fit with the rest of your team, won’t reinforce the good practices that you’ve put in place, and may end up facilitating bad habits. One of the best ways to assess CQ is in a group interview. Let the candidate get a feel for the teams they’d be working on, and let your teams get a feel for the potential hire. After the interview, ask the whole group: did that person naturally flow right along? Did that feel like an easy process? Did we enjoy that? 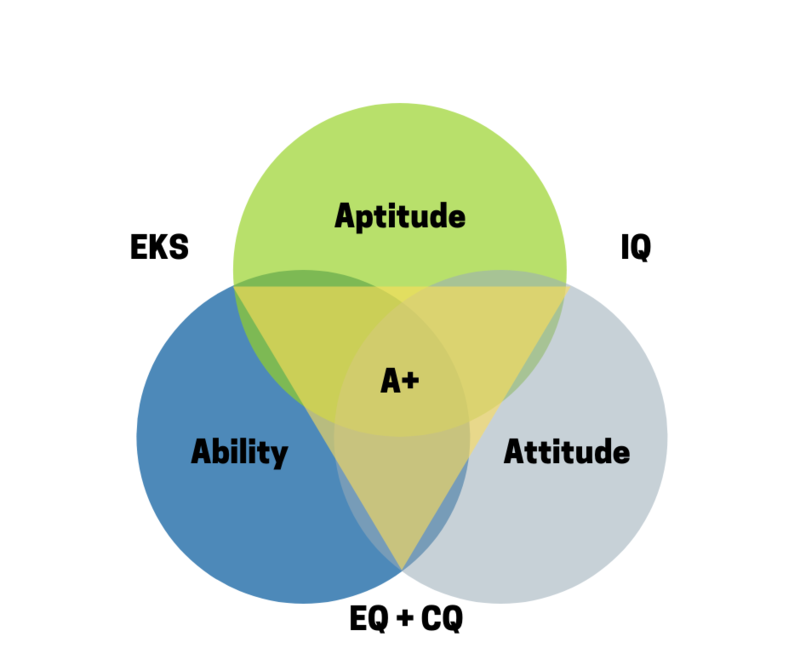 On top of IQ, EKS, EQ and CQ, we’re going to throw more letters into the mix-- when we’re looking at hiring new employees, we also look at the 3 A’s: Attitude, Aptitude, and Ability. These three qualities are ones that differentiate an A-level employee from a B-level employee. One of our big Startup Secrets about hiring: hire for will, train for skill. Remember that someone’s attitude is hugely important when it comes to whether or not they’ll be a great addition to your team. You can always teach someone the right skills, but you can’t give someone the right attitude! A candidate with the wrong attitude will be unwilling to learn, and even if they have all the abilities in the world, they’re going to drag you and your team down. Do they have problem-solving skills? Will they teach themselves new things in order to solve problems? Are they afraid of failure? (Hint: they shouldn’t be!) When they fail, do they fail fast and learn faster? Are they interested in how they can make a difference in your company, instead of just making money at a job? Are they bold enough to share their opinions and move your business forward? Aptitude ties into one of the questions we just asked: do they fail fast, and learn faster? Everyone is going to fail at times, especially if you’re going through unknown territory with your startup. If you’re breaking into a new market, or you have a completely revolutionary technology, there won’t necessarily be training that a candidate can have in advance because your project has never been done before. If they accept that they’ll fail, but know how to learn from their mistakes and push forward, you’ll have a good candidate for the quickly-moving world of startups. Ability is closely related to EKS: are they capable of doing the job? Will they excel in your workplace? Are their skill sets well suited to the position? This is something to consider in tandem with experience, knowledge, and skills. However, keep in mind that if someone has the right attitude and aptitude, they may not need the perfect abilities coming into the job! We’re adding more letters! This time, we’re giving you the three A+’s: what differentiates the A-players from the A+ players. While you may have had a good candidate for your position before, if they have one or more of these A+ qualities, they’ll be a great candidate. Awareness is incredibly important in a startup. By awareness, we mean both being self-aware and being aware of others, as in the EQ we described earlier. Self-awareness is essential here: not only is it difficult to be aware of others if you’re not self-aware, but startups move quickly and need flexible team members. You can’t speed-team, as we described earlier, if you’re not self-aware in terms of knowing your faults and your strengths. If you know where you’re weak, you can build teams around you that fill in the gaps. Sometimes, when people seem not to be self-aware, it’s because they’re not comfortable in their workplace enough to admit their weaknesses. This goes back to the idea that having an open culture that deals with failure in a positive way is often a boon to a startup; for more on building culture, check out our lesson here. There’s a common feeling with a lot of entrepreneurs and startup teams: imposter syndrome. You might be thinking, I don’t belong here! And as a result, you strive to be something that you aren’t. Look for team members that can acknowledge their imposter syndrome and move past it: you don’t want an employee that’s always trying to be something they aren’t. Instead, look for people who are authentic and comfortable with who they are. Authentic people fit into teams easily and tend to be more self-aware. Here’s one of our favorites: the Athlete. And no, we don’t mean that all your employees need to be physically fit! Instead of running a marathon, try to find employees that can last through the marathon of starting a new company. Athletes in the startup world are people who can adapt quickly, take on large projects, and adopt new processes easily. If you can’t find a candidate with the right skill set, experience, or abilities, you should hire the Athlete. The Athlete will always find a way to grow with your business and reach for success as often as they can. That was a lot of letters, but you made it through! The Golden Triangle framework has a lot of moving pieces, and you likely won’t find a candidate that has every single quality here. Think about the best mix of qualities for your business, and focus on those. Not every quality will be important for your company, or for your founding team; find employees with qualities that complement the rest of your team, and fill in the gaps that you’re missing. If you’re interested in reading more on how to conduct an interview and hire the right person, check out our lesson on Interviews. For more on how to keep your employees productive and happy after they’ve joined the company, head over to the Virtuous Cycle of Success framework. And, as always, let us know your thoughts in the forums! For more on the Golden Triangle, check out our workshop on Hiring A+ Talent. Interviews can be daunting, but have no fear! This lesson walks through the tips and tricks of interviewing to find great candidates.